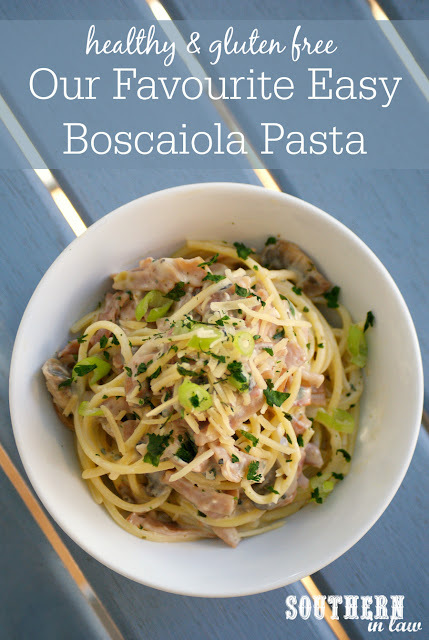 Fettucine Boscaiola has always been one of those go-to dinners in our house. It's my Mum's favourite pasta dish to make, my sister's favourite pasta dish to order and Jesse quickly fell in love with it too when he first came out to Australia. But creamy pasta dishes aren't usually considered healthy - and our original version definitely wasn't. Laden with cream and cheese, it was a once in a while treat, however, this pasta lover was determined to create a healthier, easier recipe that could be enjoyed whenever you fancy. 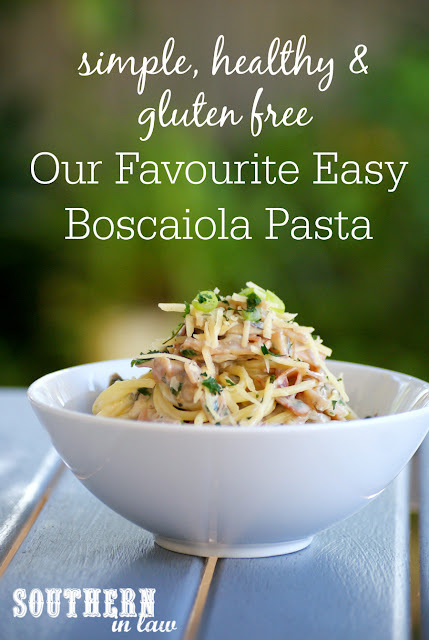 Forget zoodles or carb free noodles, I wanted to create an accessible recipe that everyone could enjoy with one not-so-secret ingredient we always have in our fridge. Though.. if zoodles are your jam, this sauce will work for them too. What ingredient was that, you ask? Cream cheese. Now, if you're not a cream cheese fan (Jesse definitely isn't! ), don't run away now. I promise you, the cream cheese is the secret to create a healthy but oh so creamy pasta sauce that you'll find yourself making over and over again. This is one pasta dishes that takes very little effort but delivers an impressive bowl of deliciousness (yup, that's a thing!). I mean really, the thing that takes the longest is the cooking of the pasta - but that just means you can prep everything else whilst that is boiling away. It's simple but nice enough to share with friends or family when you have people around for dinner - and a recipe that everyone will be asking you to share. In a non stick saucepan or frying pan over a medium-high heat, add your ham/bacon, mushrooms and garlic, stirring to cook until your mushrooms have browned and softened. If needed, add a dash of water to stop everything from sticking. Once your mushrooms and ham/bacon is almost cooked, add in your spring onions, stirring to cook for around 1 minute. Add in your cream cheese and your water, adding enough water to make a sauce with your cream cheese. Stir frequently until your cream cheese is melted and all of your ingredients are combined. Add your pasta and parmesan cheese, seasoning to taste with your salt, pepper and herbs (if using) and any other desired seasonings, stirring to ensure all of your pasta is heated and coated in the sauce. If you want the sauce thicker/thinner either continue cooking or add a little more water. Serve immediately, topping with your remaining parmesan and a sprinkle of fresh herbs/spring onions if desired. You'll note my measurements aren't exact here and that's because I don't measure when I cook dinner and instead cook by taste/feel! Play around with it and find what works for you! 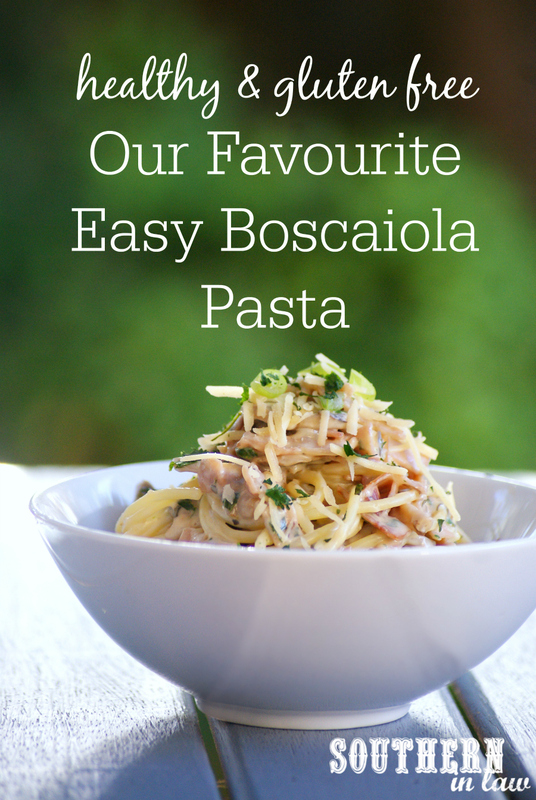 But tell me, what's your favourite pasta dish? And what's one recipe that's a bit of a staple in your household? Be sure to join us in the #SILDinnerChallenge (find out more here) on Facebook and Instagram by sharing your own dinner pics!